LOS ANGELES/HONOLULU, Dec 7 (Reuters) - It has been 75 years but U.S. Navy veteran James Leavelle can still recall watching with horror as Japanese warplanes rained bombs on his fellow sailors in the surprise attack at Pearl Harbor that plunged the United States into World War Two. Bullets bounced off the steel deck of his own ship, the Whitney, anchored just outside Honolulu harbor, but a worse fate befell those aboard the Arizona, Oklahoma, Utah and other U.S. ships that sank or capsized in the attack that killed 2,400 people. "The way the Japanese planes were coming in, when they dropped bombs, they'd drop them and then circle back," said Leavelle, a 21-year-old Navy Storekeeper Second Class at the time of the attack. Leavelle, now 96, was among 30 Pearl Harbor survivors honored at a reception in Los Angeles before heading to Honolulu to mark Wednesday's 75th anniversary of the attack. The bombing of Pearl Harbor took place at 7:55 a.m. Honolulu time on Dec. 7, 1941, famously dubbed "a date which will live in infamy" by U.S. President Franklin D. Roosevelt. Fewer than 200 survivors of the attacks there and on other military bases in Hawaii are alive. Wednesday's commemoration at a pier overlooking the memorial to the sunken Arizona began with a moment of silence at precisely that time. The battleship Arizona sank with 1,177 officers and crew on board and lies at the bottom of Pearl Harbor. Wearing leis of fresh Hawaiian flowers around their necks, about 350 U.S. veterans of World War Two and their families received blessings and prayers for peace. A performance by the Navy's Pacific Fleet Band was made bittersweet by the knowledge that every member of the USS Arizona band, one of the Navy's best, died that day. Two families were to participate in a private ceremony in which the ashes of crew members who survived the attack and died later were to be interred in a turret of the Arizona. 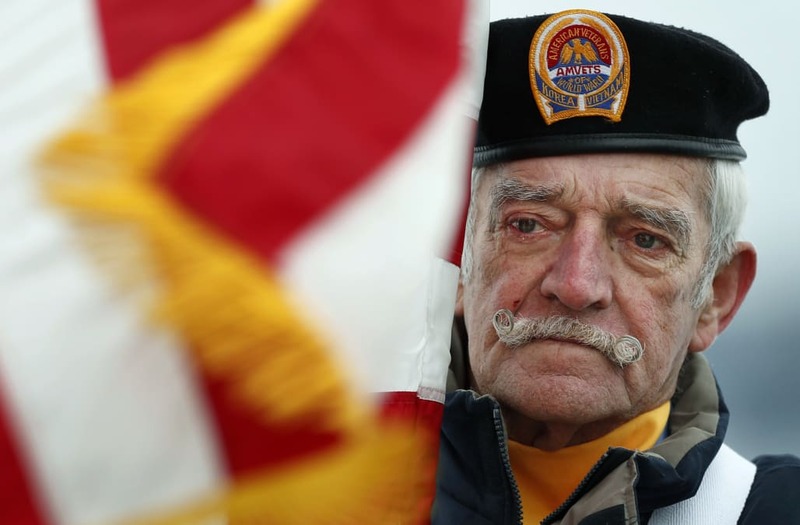 Across the United States on Wednesday, Americans remembered those who died at Pearl Harbor and the long, difficult war that followed. The shock of the Pearl Harbor attack is vividly illustrated in an exhibit at Massachusetts' Museum of World War II, which features relics including a West Point cadet's letter to his father, then-Brigadier General Dwight Eisenhower, on preparing himself for war. On Dec. 8, 1941, the United States declared war on Japan. Three days later, Germany declared war on the United States. Will Lehner, 95, was among those who had a chance to fight back in the Pearl Harbor attack. The 2nd class naval fireman was in the boiler room of the USS Ward, which was patrolling the entrance to the harbor, when crew members spotted a Japanese submarine. "That submarine was on the surface and our skipper didn't know if it was ours or not," Lehner, 20 at the time, said at the Los Angeles event. "He said, 'Load your guns.'" "The first shot went right over the top, the next shot right after it hit that submarine and punched a hole in it." After the war, a historical discrepancy nagged at Lehner. The Japanese submarine had not been recovered and many historians doubted that it existed. That changed in 2002 when the submarine was found. "For 62 years," Lehner said, "nobody believed us." For his part, Leavelle would be touched twice by the hand of history. After the war, he became a policeman in Texas. On Nov. 24, 1963, he was the Dallas officer handcuffed to Lee Harvey Oswald when the accused assassin of President John F. Kennedy was shot to death by nightclub owner Jack Ruby.